The rise in opioid drug abuse and gun violence have led to recent calls to overhaul the nation’s mental health care system. But a law passed by the U.S. Congress in 2014 is already driving a big new experiment in mental health care. The new law looks to resurrect the promise of community-based mental health care, which was first attempted in the 1960s when President Kennedy signed the Community Mental Health Act. That legislation was aimed at deinstitutionalizing mental health treatment, moving it away from large, state-run mental hospitals – which had gained a reputation for being isolating and sometimes abusive. Kennedy's legislation proposed to create hundreds of smaller community mental health centers, which were largely outpatient facilities that allowed patients to get treatment while still living at home. But only half of the proposed centers were ever built. By the early 1980s, federal funding for the program was scrapped in favor of block grants given directly to state mental health agencies to distribute as they see fit. But growing evidence supports the effectiveness of community-based care for mental health and addiction. 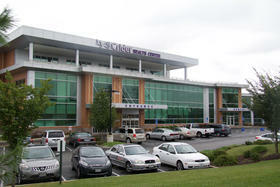 And now the Excellence in Mental Health Act is creating a new path for federal funding to pay for care at such clinics. The Act creates a new federal designation for a type of behavioral health clinic that can be funded through enhanced Medicaid payments. This is groundbreaking, explains Chuck Ingoglia, Vice President of the National Council for Behavioral Health, because it begins to put mental health treatment on equal footing with primary care. The newly recognized clinics—termed Certified Community Behavioral Health Clinics—will be able to get funding via the same mechanism that primary care safety net clinics have relied on since 2001 to treat low-income patients. Existing community mental health centers have never been eligible for this kind of funding. The new law doesn't only address the issue of funding, Ingoglia says. When the government stopped funding community mental health centers, that also meant the loss of federal standards for public mental health. States have gone their own ways, with varying degrees of success. “We have seen incredible fragmentation meaning that it’s hard for people and individuals and families to navigate the mental health system,” says Ingoglia. It also means a lot of people go untreated. 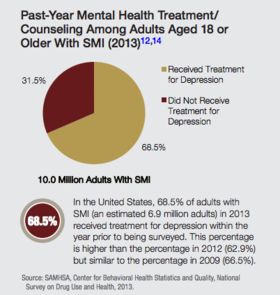 Data from a 2013 survey estimated almost one-third of American adults with a mental illness did not receive mental health treatment. In many states, that number was much higher: 54 percent in Arkansas, 58 percent in Wyoming, 66 percent in Mississippi. The new law is designed to help eliminate these differences between states by establishing national standards. This year in the Act's planning phase, 24 states are developing plans for how they would run these new mental health centers— with their new standards of care, staffing requirements and reimbursement methods. Under the law, eight states will be chosen to have their demonstration models funded in 2017. The demonstration projects are building on recent innovation in mental health care at the state level, including a successful behavioral health home program in Missouri. “Ten, twenty years from now, looking back, the hope is we’ll look at the eight states as pioneers that led us to what we hope is a new paradigm in mental health funding across the country,” says Brent McGinty, President and CEO of the Missouri Coalition for Community Behavioral Healthcare. McGinty’s organization helps run the behavioral health home program in Missouri which brings together mental health care and primary care so all of a patients’ health problems can be treated at the same clinic. A patient going to the clinic for a psychiatric appointment, for example, would also meet with a nurse who tracks important health indicators like blood pressure, blood sugar and weight, and helps the patient set health goals. Missouri’s health home program was shown to lower hospitalizations and saved the state $31 million in Medicaid spending from 2012 to 2014. But the program is only available for a small portion of Missouri’s Medicaid population – a subset of a subset of those who need mental health care. McGinty says the Excellence in Mental Health Act is an opportunity to apply lessons learned from programs like the behavioral health homes to the wider population. The federally funded clinics would be accessible to everyone, regardless of their ability to pay. Mental health advocates say the Act should be expanded more quickly than originally proposed. U.S. Senators Debbie Stabenow (D-MI) and Roy Blunt (R-MO), who sponsored the original Excellence in Mental Health Act, plan to introduce a new bill to expand the demonstration program to all 24 states still in the running. And if the national demonstration is expanded, more of the country could be seeing how far they can take public mental health as well. Copyright 2016 WFYI-FM. To see more, visit WFYI-FM.